In the morning Nibbles normally wakes up before I wake up especially in the holidays. Every morning whilst I watch TV and eat breakfast, he hears the TV on and realises that I'm up so he starts to kick the sides of his hutch to get my attention. Once I have finished eating my breakfast I finally give into the urge of getting him out of his hutch and bring Nibbles inside to have his breakfast. 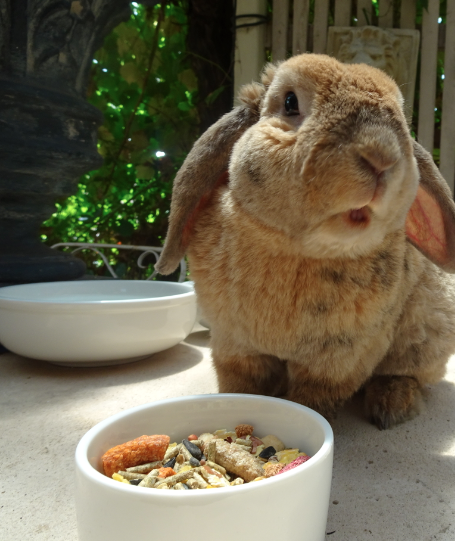 There is half a cup or less of pellets which is always at his reach throughout the day and also a bowl of water which he can drink or eat at anytime because they are the most important source of nutrients that a rabbit can have. After Nibbles has gotten a bit tired out from either playing with his toys or running around outside, or I guess just chasing me around the house. I give him a carrot once finished if he is still hungry I'll give him either some parsley or a homemade treat which I have also written a blog post on how to make them. The good thing about making your own rabbit treats is that you know there aren't any chemicals or preservatives and you definitely get a lot of rabbit treats which will last you around 4 weeks or more. After dinner I let Nibbles stay inside until he needs to go into his hutch, which is bedded with hay and newspaper underneath. Nibbles also has a drink bottle. Small animal drink bottles cost from $5 to $15 here is a cheap one which seemed to last quite a long time. I hope this helped or informed you on what is good for your rabbit to eat and what Nibbles eats daily. As at times I am not at home with Nibbles, before I go I put a carrot or a couple pieces of kale into his hutch so he wont go hungry. For rabbits, it is ideal to have around 4 hours of play time and free roaming whether it's inside your house or on the grass area.